Take a virtual trip around Austria with us, with the help of our introduction and fun facts, and collecton of useful flag printables. The Republic of Austria sits in the centre of Europe surrounded by eight countries, including Germany in the north, Switzerland to the west, Italy in the south and Hungary to the east. A land of soaring mountains, divided by fertile valleys with extensive forests and stunning lakes, Austria's has a relatively small population of 8.5m. This is surprising given its rich history and the important imperial and cultural role that the country played, sitting as it does at the crossroads of central Europe. Settled since prehistoric times, because of its strategic position and consequent importance, the region was subjected to repeated invasion from Charlemagne and the Franks in the 8th Century AD. The House of Hapsburg took control in 1278. An era of over 700 years of imperial expansion began, culminating in the 1815 Treaty of Vienna which created Europe's strongest power. In 1868 Dual-Monarchy of Austria-Hungary was established. In 1914 Archduke Ferdinand, heir to the Imperial throne, was assassinated, signalling political discontent with the empire. This assassination is often given as the beginning of the first World War. After World War I, the Republic was established in 1918. Austrian power declined as Germany expanded. After World War Two, the country was occupied by the Allies until 1954. Since 1955 Austria has been an independent member of the European Union. 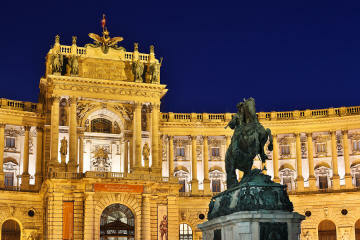 Vienna, the capital, is a grand city of opulent buildings from museums to palaces. Everywhere you can see the great wealth generated by the Austro-Hungarian empire. One such beautiful building is the Hofburg Palace, winter home of the Hapsburgs, and now to famous icons such as the Vienna Boys Choir and the Spanish Riding School. Vienna is also home to famous Cafe Sacher, opposite the Opera House, where Sachertorte, a luscious chocolate cake covered with apricot jam and icing, was invented in 1832. Visitors to Austria are attracted by winter sports, such as skiing in resorts like St Anton and Kitzbuhl. Austria was the birthplace of composers such as Mozart and Beethoven, the psychologist Sigmund Freud, politician and actor Arnold Schwarzenegger, motor racing champion Nikki Lauder and Nazi leader Adolf Hitler.